The hydroelectric power is one of the clean sources of energy. After Industrial Revolution, demand for electric power increases rapidly. So, the Hydroelectric Power Stations too. More and more power generation is the necessity of power station to fulfil the increased demand. The electricity initially produced using the renewable energy source as like hydraulic energy. Hydro electrical power is the first invention to produce electricity in large quantity. After the Hydroelectric power, engineers worked on Thermal Power Plants and then Atomic Power Plants. There is one another alternative energy source available to produce electricity, called wind power and tidal power. 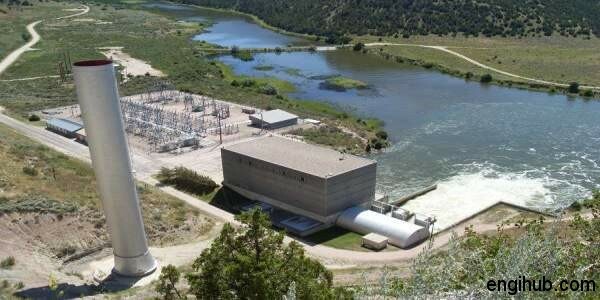 In this article, I am going to share the information on Hydroelectric Power Station. The reservoir is the section where the available water from the catchment area is stored. The storage reservoir may be natural or artificial, based on the requirement of the plant. The engineer has to decide the sufficient capacity of the reservoir. Because this water should be available for running the turbines. So, we can produce the required quantity of hydroelectric power. A dam is constructed across the river. This reservoir is on the upstream side; hence it will check the flow of water and impound it in. The size and type of dam depend upon the character of the river, head of water, an amount of discharge etc. The dam is provided with gates for regulating the flow of water. An automatic arrangement is given for overflow of the excess water. A passage through which the water is carried from the dam to the power station and then to the river is called as waterways. The upper portion is known as a head race while the lower portion is known as tailrace. The waterways may be in the form of Tunnels, Canals or Pipes. Just on upstream of the Hydroelectric Power Station, a Surge Tank is provided. So, this will eliminate the effect of water hammer. It will also control the variations in pressure. This is the place, where Water Turbines and Electric Generators are installed. The design of the hydroelectric powerhouse is very complicated and requires a lot of engineering skills. The availability of space, transport facilities etc. factors will decide the position of a powerhouse. The size of a hydroelectric power plant is decided by many factors. Such as water supply head, type of units, number and size of units, electrical arrangements etc. For better efficiency and maximum power production, the electrical generators are directly coupled with the turbines. The turbines may be designed and installed with horizontal or vertical shafts. In horizontal shaft layout, the whole installation lies on the same floor. The advantage of this layout is, easy to inspection, service or any other modification in the hydroelectric power plant. In vertical shaft layout, the generators are spaced well above the water surface. Hence it will make convenient to connect incoming pipe and outgoing draft tube.